But it really depends on actual file format. May be it will be possible to do some language injection .. or something (although not sure) -- please show an example of such file (ready to use file). Don't know how convenient/viable this approach is for you .. but it seems to be working in general (better something than nothing). 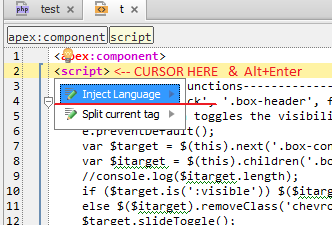 Such manipulation should affect all <script> tags in all projects .. so you may want to make it for this project only by editing such injection rule in "Settings | Language Injections". Obviously, this is not properly formatted XML file (no proper header, appex:component is unknown to IDE) so IDE will highlight those as errors -- but that's only first and last lines while whole JS code seems to be OK.
when finished -- run your file(s) through some processor/build tool/templating engine etc (using File Watchers plugin for executing such task on Save) .. that will remove such comments (e.g. 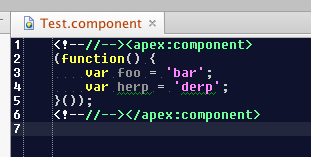 first line will become <apex:component> once again) and save final file in new location which you can then use for your purposes. Those are two great ideas- thank you very much. I think that will work.
) leaving the apex:component tags intact.
) 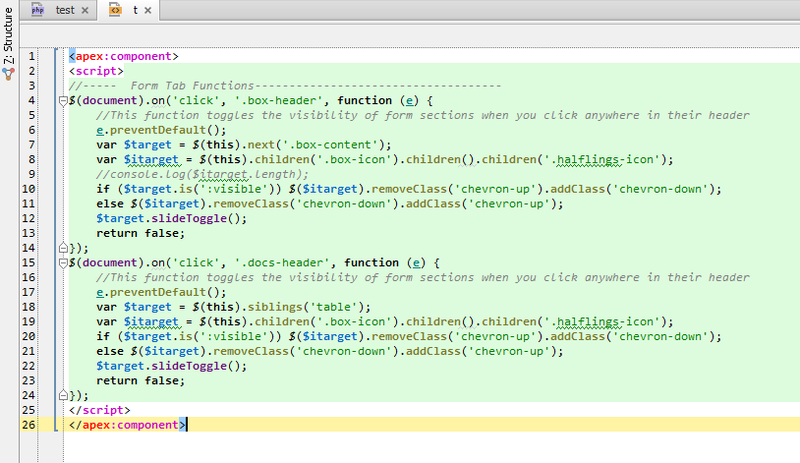 preventing the parser choking on the tags.